This is the first major revision of my Hank Williams discography. The main change is that, following comments from other respected discographers, I have created separate sessions for the overdubbing rather that adding them to the details of the original recordings. This has resulted in a much more compact database and the sessions are now arranged into just two series ‘Mothers Best’ and the rest. This is a more logical approach as quite often in an overdubbing session both studio and non-session recordings were used. The Mother’s Best recordings of course are not overdubbed and paint a picture of Country Music as it was before it was ruined by the so called ‘Nashville Sound’. I just hope that Time-Life carry on issuing complete performances as the interplay between Hank, Cousin Louie and the Drifting Cowboys is pure magic. 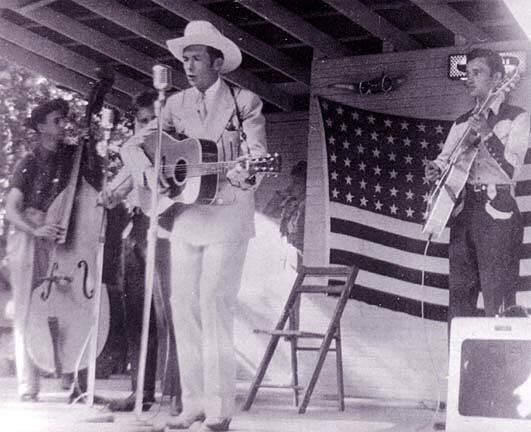 Anyone trying to create a Hank Williams discography faces two problems the first is the large number of undated recordings of varying quality that exist, these range from radio performances to studio recordings made as demos. The second problem is the overdubbing that was carried out by MGM in the years following Hank’s death on December 31 1952. At first the overdubbs were sympathetically done using the Drifting Cowboys however as the years past the overdubbing became more and more bizarre such as using the Jordanaires and even his son Hank Williams Jr. Never was the phrase “Hank Williams never did it that way” more apt. Up until 1966 MGM master numbers were composed of a numerical prefix (showing the year of recording) and letters (S for 78 rpm and XY for 45 rpm issues) followed by a number from the yearly numerical series. From 1966 a different numbering system was used which for Nashville sessions started at N 50000. In the discography there are two examples of master number duplication. “I Saw The Light” master 47-S-124 was reissued with stereo overdubs using master number 62-XY-446 but 62-XY-446 had already been assigned to another session and Ruppli & Novitsky (1998) suggest that there was confusion with 45 rpm master 51-XY-446. However the fact that “Honky Tonk Blues” master 51-S-6129 was reissued with stereo overdubs in 1961, using a matrix number 61-XY-913 which was already assigned to another session and the 45 rpm master was 51-XY-913 makes me wonder if in fact it was deliberate. The sessions are listed by date of the original recording or where the date is not known by an approximate date. In cases where the original un-dubbed version has been lost and there are two different overdubbed versions in existence and it is uncertain whether there were one or two original versions I have been conservative and created two sessions. Following each session is a list of the issues the recording is on. These are listed in format order (78, 45, 45 EP, 10” LP, 12” LP, 16” ET, Cassette, CD) and then by release date order. I have not included any of the spoken apologies or “How to Write Folk and Western Music to Sell” as I consider these items have no place in a discography of Hank Williams songs. I have listed full track details of all the 78s, 45s, 45 EPs, 10” LPs, 12” LPs, Cassettes and CDs listed on the database. Unfortunately the programme does not allow track listings such as A1 or C5 so if the issue consists of more than one record, and providing I know the track order, each individual record is given a separate catalogue entry i.e. E 4267/1 to E 4267/4. In issues with multiple CDs each CD has its own number so that is listed followed by the number of the set so the 5th disc in “The Complete Hank Williams” is catalogued as 536082-2 [set 536077-2]. If a stereo version of a record was issued on the same date as the mono and the master numbers on the two issues are identical I have combined the two issues i.e. E/SE 4300 and M/MS 509, however if the mono and stereo versions were issued on different dates they have two separate entries even if the master numbers are identical. On compilation albums that have other artists on them only the Hank Williams tracks are listed. The list of performers at the end of each issue are a combination of the performers for each of the tracks on the issue and for issues with a large number of tracks the list becomes meaningless, by choice I would not have included them but unfortunately the current version of the programme does not allow that option. Also ignore the dates on each track in the issue they are used by the programme to order the sessions in the database again hopefully they will be replaced by the recording dates on a future issue of the programme. Escott, C. 2004. Hank Williams The Biography (contains a very good discography). Pelletier, P.1995. Record Information, Issue 10 extended - M-G-M, Complete British 78/45 rpm Singles 1948-1977. Ruppli, M & E Novitsky. 1998. The MGM Labels, A Discography (3 volumes). Turpen, B. 2007. Ramblin’ Man - Short Stories from the Life of Hank Williams. Williams, R.M. 1970, 1973, 1981. Sing A Sad Song - The Life of Hank Williams (The 1981 edition contains a discography by Bob Pinson). Wilmeth, T L. 1999. Textual Problems within the Canon of Hank Williams. The Papers of the Bibliographical Society of America 93:3 379-406. I welcome any feedback (both positive and negative) especially details of any errors in track order or listing. Apart from three MGM Canada issues all the others are either US or UK so any details of other country’s issues would be useful. Also there is a complete absence of any information on cassettes and only one 8-track tape (the details of which I saw on eBay) is listed, most discographies ignore these issues but in my opinion a list of these would help to complete the picture. The discography was produced using the “BRIAN” discography programme and I would like to record my grateful thanks to Steve Albin for all his help and patience when I first started using the programme. For details of the programme see the BRIAN page at Jazzdiscography.com. Ed Guy of “Hank Williams Recordings and Memorabilia” who has confirmed the existence or otherwise of records not listed by Ruppli & Novitsky and has supplied details of the relevant master numbers. His knowledge of Hank’s issues is second to none. Svein Martin Pedersen who has been of great assistance with the “Mother’s Best” issues, he also has a great Hank Williams, Sr. Listings website. The authors of all the books mentioned in the bibliography especially Ruppli & Novitsky whose volumes supplied details of several of the more obscure master numbers.